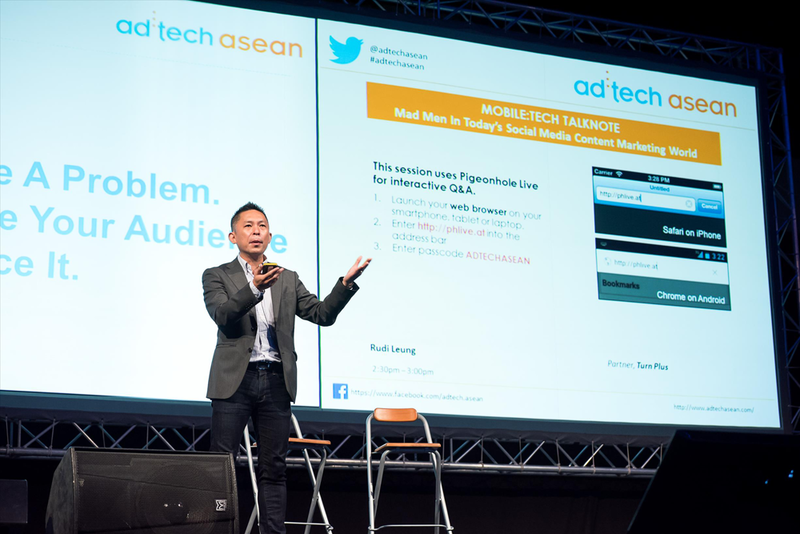 ad:tech asean Singapore 2015 was a lot smaller than last year’s event. There were just half the exhibitors on the floor so it looked a lot more empty. It did sort of prelude ad:tech’s death as we just heard that this was the last edition. We learned that it will be the last edition, as dmg:events has closed its office in Singapore. There were fewer delegates but the quality and seniority of those roaming the floor was good. The big agencies and some of the leaders in advertising tech were missing though. So what was this last ad:tech like this year? With fewer exhibitors, combined with near steady visitor numbers, ad:tech asean still loses out against those in Japan and India. Japan e.g. had 15,000 registered delegates this year. 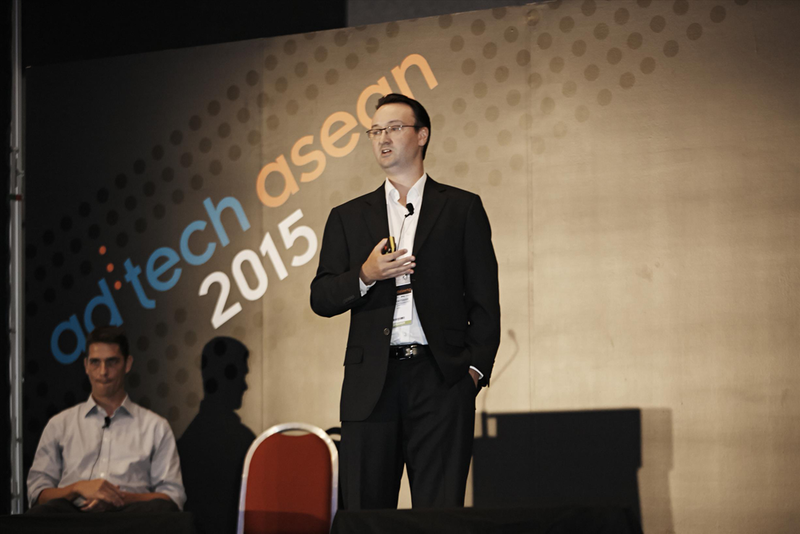 In terms of networking it ad:tech Asian is still a good place to visit. Specifically the morning of the first day the floor was very crowded and the 3 speaker rooms were nicely filled up. We were less enthusiastic about the actual topics and the overall quality though. The keynotes, workshops and clinics were hardly ever ground breaking and a lot of the times also not about technology at all. Up until last year the conference relied mostly on the tried and tested format of a trade floor with exhibitors, a speakers’ corner and 3 bigger halls for keynote speakers. This year we were promised a new format through workshops and unplugged ‘hands-on’ sessions. The unplugged sessions e.g. were conducted with smaller groups. For these sessions the conference delegates could suggest a topic upfront or pick and choose from a list. The success of this type of sessions depends largely on the moderator’s capability to build and direct a constructive discussion. It turns out that the quality of the sessions varied. The organiser admitted that there is room for improvement. The speaker and panel sessions this year covered a wide range of topics that included the ubiquitous buzzwords such as big data, mobile and customer experience. Most speakers lived up to the promise of their topic but there were a few missed opportunities. The opening panel on diversity e.g. babbled on for half an hour, producing a ton of generic statements about the importance of diversity marketing. But it was hard to figure out what the underlying message to the audience was or how diversity relates to advertising technology. There were a few highlights as well. Here are our observations. Huw Hopkin, global head for demand generation at Cisco, explained how retail can benefit from the internet of everything, known to others as the internet of things. He highlighted how the use of realtime data in combination with process builds the connection between people and things. The process part is important for retail because you need to communicate with customers, depending on where they are in the buying journey. One very true and important remark Huw made, was that decision making about technology is no longer only the responsibility of the IT department. Today and specifically when it comes to the internet of everything, all departments should be involved in the development and deployment of an all-encompassing marketing engine that accompanies the customer. This refreshing approach is entirely based on the assumption that marketing these days is a lot about change and doing things differently in an organisation. 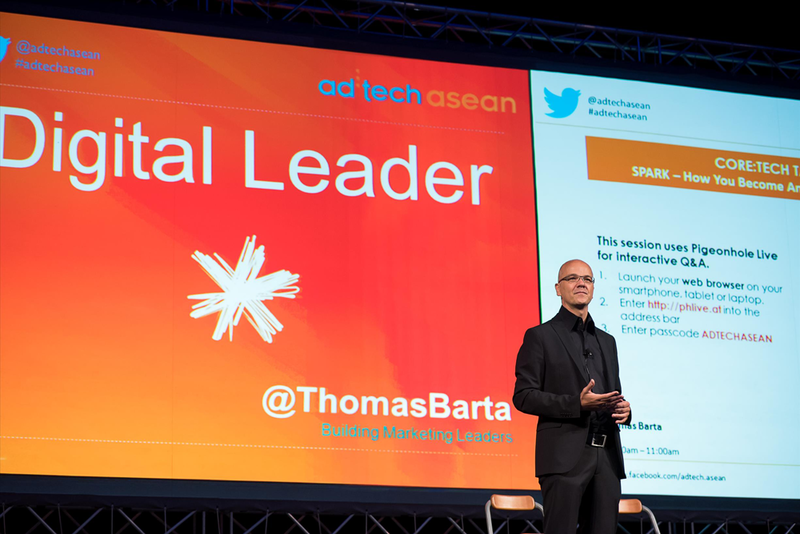 To avoid early failure or lack of results, Thomas argued, applying the 4 powers will help marketers to turn into leaders and succeed. He also explained how marketers should act more and ask for forgiveness later. There is no time to wait for headquarters’ sign-off. Today’s business environment is simply moving to fast. But in order to succeed one big thing is important, you got to be inspired first because only that will give you the drive and purpose to keep going when the going gets tough. An example of a good workshop was certainly the ‘How to Drive Massive Results with Email Marketing in 2015’ presentation by Mac Ossowski, director of enterprise sales at GetResponse. Mac gave a series of very practical and hands-on tips that will help increasing the response you get to email. Among them featured of course the importance of responsive design for mobile devices and clever personalisation. His tips and tricks might known territory for corporates and agencies but judging from the questions, the smaller companies could really benefit from his insights. Rudi Leung, partner at Turn Plus, is well known for his passion about content marketing. In his keynote he focused on the importance of content planning, bite size story telling and engaging your audience. He used a few cases to illustrate his points. At Genhi Sushi e.g. content is planned 365 days ahead, i.e. for one full year. This is important as it provides guidance for the development of content pieces and assets. He also went on to explain how you should allow the audience to finish a story and how you can engage an audience better by showing them a problem or a challenging and letting them solve it. Stuart la Brooy, head of digital creative content, delivered another highlight on the first day, explaining how P&G engages with bloggers on social media. 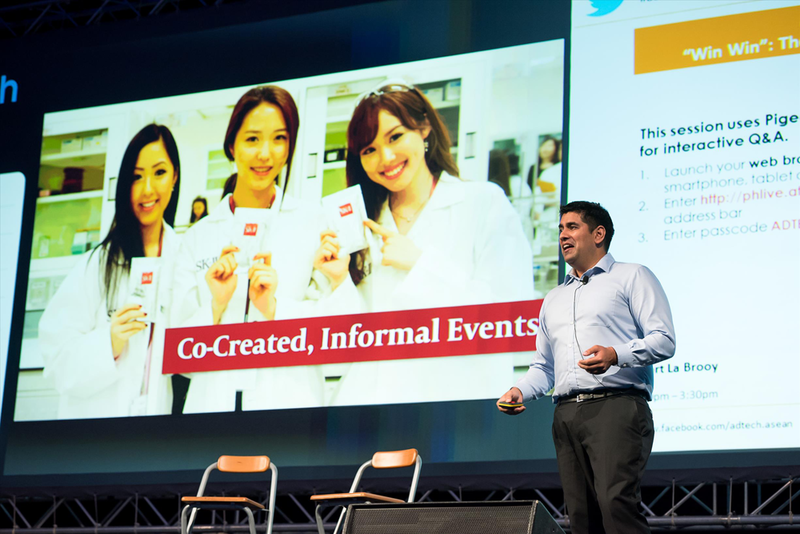 His presentation, titled “Win Win”: The Power of Content Through Collaboration, clarified how P&G engages with influential bloggers in the field of beauty and cosmetics. It was refreshing to see how P&G gets social media marketing absolutely right by not influencing or controlling bloggers in any capacity but through true collaboration. He uses a simple framework that allows P&G to build expertise, grows an audience to then make a difference for the brand. To me the highlight of the second day was a presentation by Joshua Steimle. Joshua is a TEDx speaker, CEO of MWI and above all an expert in digital marketing. His workshop session focused on 10 steps any company can take to do marketing on a budget. Although he never used the term, his presentation touched many topics that I would call the growth hacking space. Joshua explained why it is important to have a responsive website, optimised for mobile and how you can get one on a budget. He went on to explain how using Haro for expert ‘crowd sourced’ advice, SlideShare, Tinyletter. curating content, infographics using Canva, Google MyBusiness, writing as an unpaid editor and finally Youtube can help you boost demand. The refreshing part of his approach is that what he explains is indeed valid across businesses and can be applied from start-ups, right up until the corporates. 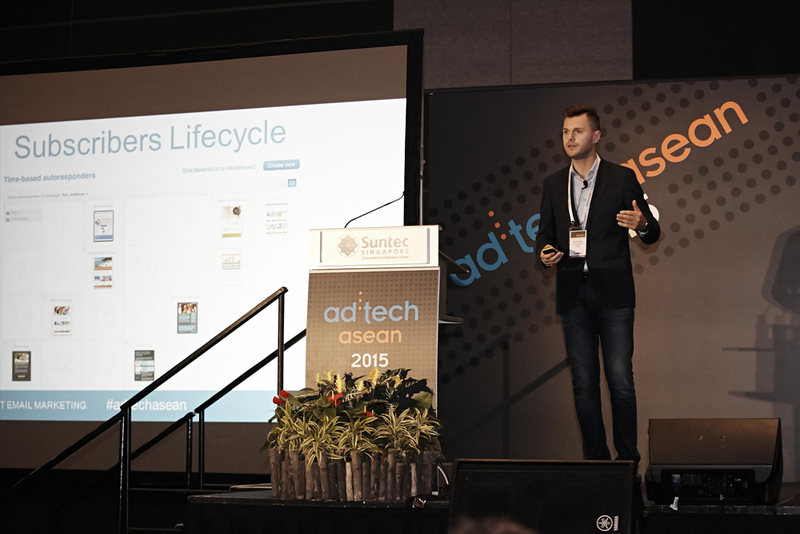 So ad:tech was like previous versions, a great place to meet peers, network and refresh your knowledge. The new format of some of the sessions only partially delivered. In our opinion this is largely due to the fact that they were moderated by DSPs. The big agencies were mostly absent, both as sponsor and as delegates.